FAQ: What do I need to consider before buying a pillow tank? Question: I need an economical solution for liquid storage, and am looking into your pillow tank. What should I consider before buying one? Answer: Before buying a pillow tank for liquid storage there a few things you should ask yourself. Doing so makes sure you are not only getting the best type of pillow tank, but the best tank for your application. 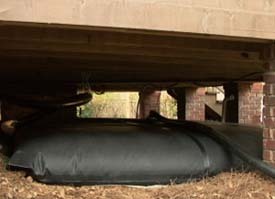 Pillow tanks, or Water Bladders, are extremely flexible and versatile tanks, that can been effectively used to store drinking water and non-potable liquids. These tanks start at a standard size of 25 gallons, and can come in capacities as large as 210,000 gallons. 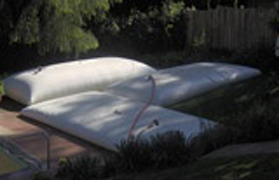 Water storage bladders are typically designed to store the specific liquids rated for the fabric. Drinking water will be stored in fabrics that are NSF 61 and FDA approved. Gray water storage fabrics do not have these certifications for drinking water. Gray water can be stored in drinking water tanks, but drinking water should not be stored in a gray water tank. When using the tanks for fuels and chemicals a MSDS (material safety data sheet) may be needed to determine the best tank fabric for the contents used in the tank. No mater what liquid you choose our tanks come in sizes starting at 25 gallons and can go all the way to 210,000. We have standard sizes for small and large liquid storage pillow tanks, and custom sizes are available. This calculator can show you an average amount of water you will use in a day, month, and even year. If you are looking at liquid storage and need some help figuring out what capacity you need feel free to contact us for help. How are you Planning on Storing the Tank? The material and design for liquid storage of the pillow tanks requires the tank to be stored with certain criterias. First off, these tanks are made for stationary use. They are not designed for any kind of transportation when they are filled with liquids. However, when empty can easily be moved from one place to another. The ideal place to store a pillow tank is on a flat surface, with no pressure, and not around anything that could fall on the tank. Many users will keep their tank in its own storage room, a crawl space or under decks. Places where they can gain access to the tank and the tank is completely protect. However this is not a requirement. These tanks can also be stored outdoors. The tanks can be made to withstand temperatures that range from -58 to 180F and fabrics can be made so your tank can have UV resistance. Questions? We can help! Call us at +1-772-646-0597 or contact us to discuss your project.